One has to wonder how good we marketers really are at communication. I’m pondering this again because for the second time in about 10 days, I’ve seen Direct Marketing referred to as a media channel. And the reference hasn’t been by fresh-faced graduates who don’t know any better. In one document by a major financial brand it was used in the context of how to integrate new media with traditional DM, whatever that means? The other reference was in a survey by my good friends at Marketing magazine. See the image below. 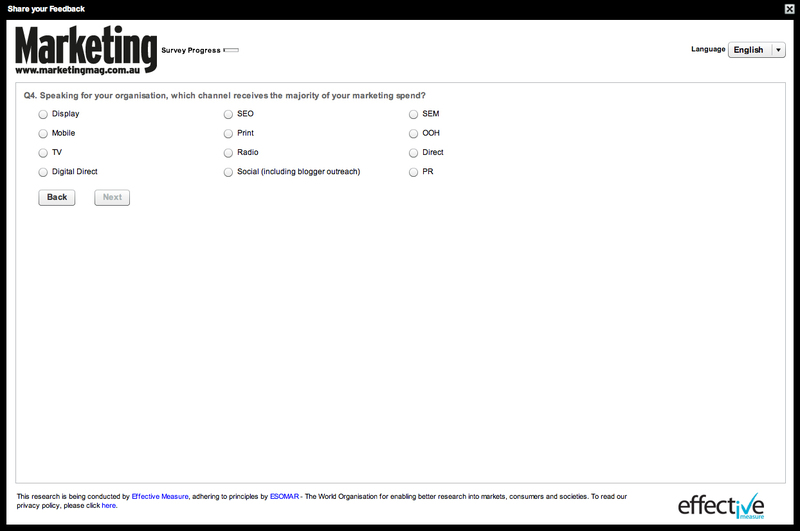 The survey question is: “Speaking for your organisation, which channel receives the majority of your marketing spend. Then there is a choice of 12 ‘channels’ including: Direct; Digital Direct; and PR – all of which are not media channels. The person who put this survey together clearly doesn’t understand marketing. With due respect, how are they going to use the results when the questions are flawed? Let’s go back to 101 marketing folks. Direct marketing is a way of marketing. It is not a media channel, like TV, or online or mail. It cannot be used in the context of integrating with new media. It exists in new media every day. Direct marketing is a way of marketing where the marketer communicates directly with their customers or prospects, or they respond directly to the marketer – in any media. The response is measurable and involves an exchange of either money (eg a sale) or data (eg a subscription in return for an email address). The most popular DM channel is now the internet, because everything you do online is measurable and can be tested. That’s why we also say DM is the art of losing money in very small amounts, so you can make money in large amounts. Test and learn, test and learn. Then roll-out to your total audience. (My partner Drayton Bird and I first muttered that statement while we were solving the problems of the world on our umpteenth bottle of vino). This lack of understanding of the way of marketing in 2012 is frightening. Why have we failed so? I think it’s partly to do with the way marketing is taught at tertiary level. Many education institutions are still teaching mass marketing as the only way of marketing – with everything else being some sort of derivative. Remember, there are only two ways of marketing – direct marketing and mass marketing. (see my earlier post in January this year). Another reason we’re failing is that marketers don’t invest in learning their craft – they stay working in one discipline or channel and really don’t invest in understanding all there is to marketing. As one business owner reminded me recently, most big brand marketers rarely spend their own money – they only spend budgets. They don’t have to suffer any consequences to their own finances if the marketing activity doesn’t work. So why should they really get to understand their craft? That may seem a bit harsh, but the only thing that differentiates marketers from each another is their knowledge and experience. And if we don’t even know how marketing is defined, what hope has the future of the industry?